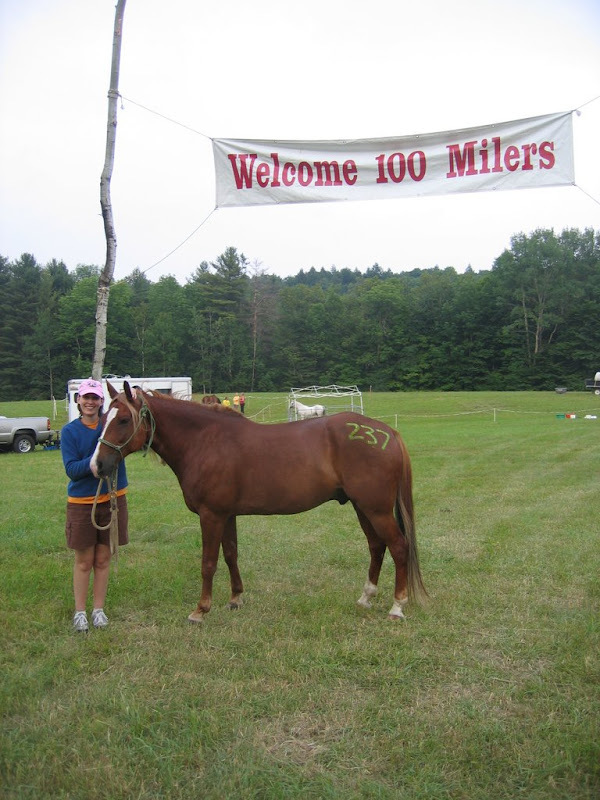 one-day Vermont 100, and the three-day 100-mile competitive trail ride. me to ride Springtime, a chestnut-colored Arabian mare sired by Omar. figured that I would ride whatever tack and saddle fit the horse. arranged to meet me several times on the 100-mile trail. after some uncertainty and wandering around, we passed under the banner. Our 100-mile adventure was underway. concerned when we passed twelve miles or so and did not see the first stop. We crossed the covered bridge at Taftsville and continued on up the trail. stone walls along the trail were all that remained of a family's homestead. every time the trail turned on a road that had the word "Hill" in the name. Sharon and continued on to the river and the second vet check at Highbrook. of Sharon and I left the hold before Bill and Laura arrived. Springtime was very well behaved. mind for quite some time. We rode on through the trails and up to the top of Heartbreak Hill. moss on the decaying logs and lightning bugs making streaks in the darkness. the darkness with no lights while trusting my horse to find a safe path. horses had been mentally tough for her. I talked with my crew at the hold. Laura Hayes and Bill Taylor joined the crew, and Paul Kendal was there too. more for my confidence than for Springtime's motivation. and we were back to the ten-minutes per mile pace or better. runners who were all chasing the 24-hour cutoff. Everyone was motivated. forest with a horse and rider close behind. friends. I am very lucky. After Pine Tree, I decided that if we had kept a more reasonable pace for the first half of the ride we would have been in much better shape at the end, and capable of going much further. So I decided to enter the Moonlight in VT 75 that was being held 3 weeks later. The name of the game would be GOOOO SLOOOOOW. To that end, I practiced getting off and jogging alongside. Unfortunately, I soon remembered that the reason I don't usually do that is because Zephyr trots at a minimum of 8mph and I run at a maximum of 6mph (and that only lasts a few yards). Nonetheless, we worked on it a few days in a row and I thought we had it down. I even ordered some Dirty Girl Gaiters to fit over the tops of my shoes and keep the dirt out because I can't wear half chaps. Of course I bought yellow. On Tuesday of ride week, my Dad agreed to crew for me. He isn't a horse person and had never crewed before, but he wanted to spend some time with me. I was just as excited about it as he was. I waited until Friday morning when he was in the truck and we were headed down the road before I told him that, just the night before, I had decided to up the ante and ride the 100. I broke the news by telling him about a book I'd read as a child. It was about a mommy badger who had eight pups/kits/cubs and one by one they got lost or died and she never noticed UNTIL she was down to two... because badgers can only count "One, Two, Many". (Yes, it was an odd book.) My theory, backed up by opinions of the enthusiastic members of the "New to 100s" Yahoo Group, was that if I thought we could finish the 75 then surely we could also finish the 100. Everyone says after you hit 60-70 miles you're over the hump anyway. The theory was that this ride would seem like "25, 50, Many." He was game, but of course he teased me about kidnapping him before I broke the news! We arrived in camp around 12:30. The "cheap" part of town (small rigs, no generators) was still pretty empty but the "ritzy neighborhood" was chock full. We puttered around setting up our campsite, including Zephyr's pen and Dad's tent. I went up and vetted in while he finished getting everything ready. In the picture below, you can see Zephyr underneath the awning. During the ride meeting there were some sprinkles and some wind, but nothing bad. After the manager, day manager, and vets had finished their talks and asked for questions, I spoke up and said I was attempting a first 100 for myself and my horse and would like someone experienced to ride with. Laura Hayes volunteered herself, Bill, and Tom... they planned to walk flat-footed out of camp and keep a reasonably slow pace. Great! I was very excited to have lucked out like that. Dinner, as always, was amazing. Those runners know how to put on a spread. I filled up my plate and only could eat half, and of course Dad chimed in with the "I knew you couldn't eat all that!" line that parents can deliver so well. Dinner conversation was great, we talked to a bunch of runners and also several riders. One experienced crew-person assured Dad that his coworkers' assessment of his job for the weekend was pretty much spot on... he was going to be "The Waterboy". He said as long as he didn't have to shovel poop he was good. Before we lost the light, we got the obligatory pictures under the start banner. MAN he looks short here. He's also wearing a 3-digit number starting with a 2. It's the first time I've ever seen the 100-mile horses marked that way, normally it starts with a 1. If there are 75-milers usually they have a 3-digit number starting with a 7. Oh well, it's not like I've waited 6 years for my horse to wear a 100-something number anyway, right? Right?? Guess I should have stuck with the 75-miler... then his number would have been 106. After the photo shoot, Dad helped me load into the truck whatever I had ready at that point. He went to bed shortly afterwards... maybe 8:30. I felt bad because I knew I'd be making noise for the next couple of hours, getting the rest of my gear ready. I slept about 3 hours overnight. There was some rain, and of course I had one ear open for loose horses (especially mine), but mostly I listened to the endless sounds of a camp full of horses, riders, runners, crew, and volunteers. When the alarm went off at 3:00 a.m. I was already awake. I quickly got up and fed Zephyr, then went back to lay down for a few more minutes. I was up and eating breakfast when the runners started at 4:00 a.m. They softly shuffled downhill past our row of trailers, their headlamps and handheld flashlights shining brightly and bobbing as they cheered and were cheered for by onlookers. Some wore trash bags and ponchos in a futile effort to stay dry in the thick, foggy dawn air. From the back, after they all passed, they were a half-mile-long glowworm oozing through the dark. I checked in with the starter at exactly 4:30. Tacking up by the light of a flourescent lantern went more quickly once Dad came over to help, as Zephyr didn't want to stand still. I was in the saddle at about 4:50, with no idea what Laura, Bill, or Tom looked like under helmets and on top of horses. I peered through the fog, asking people if they were Laura, or if they knew her. Zephyr misbehaved while waiting, sidepassing and tossing his head. We waited until the end, looking for three other horses hanging back in the crowd. After a moment I moved to the start line, asking the crowd whether they knew whether Laura, Bill and Tom had come through yet. Nobody knew. Oh well. Here we go. Dad was walking back down the hill to the trailer when I passed him. He was surprised to see me, he had thought I'd already left. He'd wished good luck to the rider of a different chestnut horse wearing yellow tack before he'd realized it wasn't me. I believe he managed to get a picture, but he hasn't sent it to me yet. We headed down the long hill out of camp walking behind everyone else, but soon passed two horses because Zephyr began to gait. He went in between foxtrot and rack for the next 3-5 miles. I would have preferred a nice slow trot but he made it quite clear that trotting with a low head and slow speed was not possible for him just then; a 6mph foxtrot/rack was all he could offer. I wished he would trot because we don't usually gait for so long; I worried that it would be hard on his body. After those first few miles he did trot at about 7-8 mph. It was a relief. The two horses that we had passed at the beginning passed us about then, at a good steady trot. They reported seeing a couple of horses still behind me. I thought that was probably Laura et al but I knew I couldn't stop to wait and see. The intel might have been wrong and where would that have left me? Further behind the crowd than I already was. At this point, Zephyr was mentally well-established in plodding along in a slow trot. The humidity may have contributed to his willingness to trot slowly. Once we were moving I was warm enough to take my windbreaker off and tie it around my waist. The trails were beautiful and because we were moving so slowly I had a chance to take some pictures. After a while, we rode through the center of a quaint little downtown area. I had passed a female runner several times who was wearing all pink with the name TAMMY written in magic marker across her chest. Tammy took pictures of everything she passed and that passed her, including probably 20 just of Zephyr and I. We chatted a bit; it was her first time at the Vermont 100 but not her first 100-miler. She planned a slow and easy pace. I just hoped she had a big enough memory card to last her the distance! There was a traffic cop to help us through the intersection at the center of downtown, and then we crossed a beautiful old covered bridge where Tammy took my camera so I could have a picture of us crossing. The first leg of the ride lasted F-O-R-E-V-E-R. It was supposed to be 12 miles but I know what 12 miles feels like. I was sure I'd missed the first stop, which I thought was supposed to be a flyby. I thought maybe Dad had gone there, decided I'd already been through, and left. I started looking for Hold 1. Everywhere along this stretch of trail there were trees down. In some cases it was just a few branches piled alongside the road. In other cases there were enormous trees, obviously centuries old, cracked through with the top half slanting at an angle, or with the entire root structure exposed and the whole tree tipping over from the base. The fresh cracks were obscenely bright against the weathered old gentlemen's bark, an ugly atrocity seen through the calm and peaceful blanket of the still-humid morning. Eventually I came to a left turn on the dirt road. Straight ahead of me was a massive tree, laying across the road and on top of the roadside power lines. I followed the signs left into a field where a vet, my Dad, and a couple volunteers all waited. The first thing they said was that this was indeed the 12 mile stop, but that it was indeed more like 15 miles. My GPS agreed. OK then, I thought, that stinks but at least this is the flyby and not the hold, so I didn't miss anything out on trail. How odd, a flyby in a field! I wonder why the vet is here, he must be doing on-trail observations. Then someone solemnly announced that I was running overtime, and that after my hold time had passed I had better get some boogie in it. "What? What hold time? I thought this was the crew stop! This is the HOLD? Where is everyone?" I had made a crucial mistake. Because I had studied the schedule for the 75 in such detail, I had only glanced at the schedule for the 100. I'd seen "Pit Crew #1" at 12 miles, and "Hold 1" at 18 miles, but I'd missed the fact that there was a 10-minute hold time listed for PC1. In my defense, though, I KNOW I'm not the only person who finds this ride's Hold Schedule really hard to understand. I don't know how I missed hearing it at the meeting, but I did. During those 10 minutes, Laura, Bill, and Tom arrived. We very briefly exclaimed over having missed each other at the start; it turned out they had ridden together uphill on the road for a few minutes until everyone had left, then turned around and actually started. Lesson learned... make a firm plan about when/where to meet up at the start. Ten scatterbrained minutes after arriving, I hauled myself back into the saddle and headed out. Zephyr had eaten and drunk well, but I had done neither. I had been focused on a couple of tack adjustments; other than that I honestly have no idea where the time went. I think I was shellshocked from discovering how far behind I truly was. You see, the Open/Close times for all the Holds had been calculated based on a first leg of 12 miles... not 15... so our slow average speed at the start meant we were going to need to chase the closing times all day. I boogied as much as I could for the next 6 miles, and arrived at Hold 1 ("Galaxy Hill") just 4 minutes before the closing time of 8:40 a.m. I was still so distracted that I didn't get him over to the vet for his pulse time as soon as I'm sure I could have; he was at 52 by the time I went over. I believe he vetted through with mostly As, but A- for impulsion/willingness. I remember asking Dad "Where's the awesome view? Management said the Galaxy Hill hold has a view so spectacular that everyone calls it The Sound of Music!" Dad shushed me and told me to eat something so I dropped the subject. I waited 2 minutes past my out time so I could leave with Laura, Bill, and Tom. Again, because I hadn't studied the Hold Schedule well enough, I didn't realize the next leg was 24 miles. I must have thought it was 16 miles because that was the length of the first leg of the 75. We didn't really talk about it, either, as I recall. Finally, I had no idea that in that leg there were only 2 flybys. For some reason I expected a flyby roughly every 5 miles, certainly not any more than 10 miles apart. We rode and rode, and rode some more. Sometimes we all rode together, sometimes it was just me and Tom, and sometimes it was just me and Laura with Tom ahead and Bill behind. Zephyr had plenty of energy and tried hard to lead the way but Tom's horse would have none of it. I took this picture during one of the times Tom was ahead out of sight. It was "all butterflies and kittens" until I rode a few more feet and saw the way down. Yikes. I do not ride down hills that steep. I do not ski down them. I usually do not even walk down them. My gut instinct was to sit and scooch down on my bum! I'm sorry I don't have a picture but my hands were too busy shaking and my brain was too busy turning around and walking back the other way. We all got off our horses to lead them down. Tom and Laura walked down fast and may have even jogged, while meanwhile poor Bill got stuck behind the freak who is scared absolutely stiff at the thought of even having to drive down a hill like this. He was very patient and truly "talked me down" just like the Ski Patrol does when you freeze up. I know. They've come for me before. At the bottom, the pads of my feet were burning from slipping against the vinyl of my orthopedic insoles while my toes grabbed futilely for security in the dirt. I was a good sport though and we jogged behind Bill for a few yards before he and I both agreed it was time to mount up. Bill and I caught up to Laura, who was having trouble with her horse's shoes (Epona, I think??). One of them had broken clean in half! She pulled an Easyboot on and continued on foot. Eventually she mounted again and we all rode together for a while. I think there was a flyby in there somewhere, I remember stopping at one while I was with Bill and Laura. She didn't stay long, but walked on ahead. Bill and I left the flyby together having been told we had another obscene number of miles to go until Hold 2. I believe it was 12 miles. Keep in mind, I was still thinking this entire leg was only 16 miles. So I was hugely confused and discouraged to hear that the endless miles between Hold 1 and this flyby had added up to only FOUR MILES! For pete's sake, we had trotted a lot of it, so there COULDN'T still be 12 miles to go before Hold 2! I almost passed out from the shock of trying (and failing) to get the numbers to add up. As I left, Dad told me that the next pit crew stop was about 4 miles down the trail, and he ordered me to hustle! I think somehow I got ahead of both Bill and Laura, but I don't remember how. All I know is I did that 4 miles alone and seriously booked it. I think it may have been mostly woods trail, and if so, that would have helped. We just got in a zone, even to the point that we began ignoring the runners we passed unless I had to call ahead to tell them which side of the trail we would pass them on. Leaving the second and last flyby on that leg, Dad told me Hold 2 was about 7 miles down the trail. Given the warped nature of time/distance that morning, it might as well have been 50. Still, we dug in. Soon there was a nice shallow river crossing. It took some convincing before Zephyr would cross it; he just wanted to stand in the middle and play. We were both doing reasonably well when we turned right at a Y where the left-hand side was named something along the lines of "Incredibly Steep Hill Road" ... and it headed straight up at a 90° angle to prove it... and the right-hand side was named something along the lines of "Frederick's Hill Road". Frederick sounds like a nice well-mannered man, I thought, as I cackled to myself at not having to climb up Incredibly Steep Hill Road. We went around a corner. I got off to walk. I would have sworn that hill was at least 4 miles long. After a while there was a house with a teenage girl in the driveway minding buckets of water for the horses. I thanked her profusely. She promised we were almost at the top. I think, although I'm not sure because I wasn't looking at my watch, that it may have taken us an hour to climb that hill. Runners passed us, but no horses although I know Bill and Laura were back there. (Turns out, Laura had stopped at the second flyby to replace the shoe. She's a farrier.) I heard later that it is exactly 2 miles long, and I doubt we averaged more than 2 mph going up it. When we finally reached the top, I tried to get Zephyr to stand in the ditch so I could get on. He wasn't having it. After a moment a runner came by and I begged him to hold my stirrup. I was up. We were off. By this point it had been probably 3 miles and well over an hour since Zephyr had seen another horse. He was pretty convinced that I had taken him on a well-desguised training ride. He's very lazy on training rides. It was all I could do to get him to trot slowly along behind a runner, and if that runner walked, Zephyr would too (in a most abrupt fashion that dug my GPS right into my tummy). That's all well and good, but I was also getting funny readings from the heart rate monitor; it seemed as if his heart rate was spiking whenever we trotted. The problem was that I couldn't tell if those were real readings or not, I'd been having trouble with the Wearlink belt sliding back really far and I suspected the thin fabric may have been twisted under the saddle. No telling what effect that would have. At this point, every runner we saw on trail asked if Zephyr was OK. They knew I'd struggled on the hill (although Zephyr hadn't) and that I didn't know whether the heart rate monitor was malfunctioning. I didn't really know what to say to them. I alternated between telling them "we're overtime, we're done" as we walked along, and spanking him up into a trot to see how he responded. I just couldn' t tell if I could believe the monitor readings. Every time I spanked him, I winced, wondering if the runners were judging me for urging forward a horse I didn't know was really OK. Although I don't really remember specifics, we must have finally gotten into the groove. We were trotting steadily for a while before we got to Hold 2. Tom was still there, but was scheduled to leave just a few minutes after we arrived. We got there 30 minutes past the cutoff time but the vet informed me that management wasn't going to officially enforce Closing times until Hold 4. However, he strongly suggested that I pull; he said the trail only got harder from there and we would need to drastically increase our average speed to make the Closing times. During the trot-out Zephyr showed further deterioration of willingness and impulsion... something that had been obvious to me on the trail... so that would have made an increase in speed difficult unless we had a horse to pace with. I was overheated and drained... from not eating right (out of distraction over the seemingly distorted time/distance), from walking up that hill, and from having work so hard to encourage Zephyr to trot when he had no motivation of his own. It wasn't hard for the vet to convince me we didn't have a prayer of meeting cutoff times. Dad and I were told we needed to wait until Laura and Bill came in, so they could be given the option of trailering their horses back to camp with Zephyr. I think they came in about 3:00. At first they wanted to continue on, and try to make up the time now that Laura's horse had its shoe back, but again the vet was influential in the decision. The trailer would only hold 2 horses, though, so they opted to ride their horses back to ridecamp to save the volunteer the trip. As soon as the decision was made, I hustled Zephyr to the waiting trailer. I heard thunder in the distance and it was starting to rain; I hate thunder and I wanted to get him back to camp before all heck broke loose. The volunteer trailer driver stopped at the top of the hill for me to unload. I grabbed Zephyr and ran down the hill as fast as I could under the blackening sky, with a sound and happy horse running beside me. As soon as I got him back to the trailer it began to rain. There were no other horses in camp and I was afraid he'd freak out during the storm, so I tried to load him on the trailer where I was sure he'd be safe. However, the step up was huge because the downhill (right) side of the trailer was on blocks, so he was uncharacteristically unwilling. I quickly pulled out his rain sheet, put it on him, and led him to his pen. Before I went in, though, it began to rain harder. The wind was picking up and the thunder was getting closer. Camp was so deserted I could practically see tumbleweeds blowing through. Scared for him, I resolved to load him on that trailer if it killed me. Lucky for me, the rider "next door" came in for her first in-camp Hold just then. She offered to help and at first I turned her down, but she had the good sense to just take the lead rope despite my protests that he would NOT get on that trailer if there was someone in there ahead of him. She hopped on, I tapped his hip, he hopped on and stood quietly while she snuck out next to him. YAY! Thanks Becky Cahill! He was still wearing his rain sheet but my first priority was to get his hay bag out of the truck. As I was doing so, the wind at my back picked up so strongly and quickly that it knocked my breath from me. Suddenly I realized it wasn't just cold, it hurt! Dime-sized hail was striking me at somewhere around 50 mph! Before a full second passed I was totally and completely soaked and freezing from the inside out. Becky huddled with her horse inside her open-sided stock trailer. I struggled to get the hay bag in through the open trailer window while Zephyr was trying just as hard to stick his head out through it to see what was going on. When I finished with the hay bag, I walked around behind the trailer to shut the door, just in time to see a tent and a folding canopy go careening end-over-end through several horse corrals, including the one right next to Zephyr's. Dad, meanwhile, was sitting in the truck watching two 50-mile riders come in to the trailer on the other side of me for their hold time. He said later that it was amazing to watch; they just went about their business. As soon as I got into the dressing room I peeled off my dripping clothes and toweled dry. I was standing there buck naked when I heard a loud bang. The wind had shifted 180° the other direction and had blown open the side escape door into the horse area. In the few seconds it took me to jump into dry clothes, the entire inside of the front stall got soaked! And of course after I went out there to shut the door, my dry clothes were no longer dry. On Sunday morning we left camp at around 9:45, but we had to stop for gas and breakfast sandwiches (there were none, we had to get tuna). I didn't drop Dad off until 3:00, and got home around 5:30 or so. I went straight to bed... after unloading and feeding Zephyr of course. He was fine, in high spirits with plenty of energy. The new farrier did a good job and the shoes stayed on great. The interference boots did the trick too. All is well. At the decision point, it was 2:00 p.m. and we were at Mile 42 with a 45-minute hold awaiting us. The five 75-mile horses had already come and gone from Hold 2 and were somewhere on the trail ahead of us; the 50-mile horses were at the start line. The first 42 miles had taken us 8 hours and 20 minutes' ride time, including the few minutes spent at flybys but not including the 40 minutes of hold time, for an average speed of around 5 mph not including the holds. There was an 18-mile leg from Hold 2 (at 42 miles) to Hold 3 (at 60 miles). If we had left Hold 2 at 2:50 and been able to increase our average speed to 6 mph, it would have taken 3 hours... which would have meant arriving at Hold 3 just before 6:00 p.m. for our 60-minute hold time. The suggested Closing time (which wouldn't be enforced) was 6:00 p.m. We wouldn't have left Hold 3 until around 7:00 p.m. The 50-milers don't join up with the 100-mile trail until Hold 4 (at 70 miles) and their Closing time for Hold 4 was 7:00! (Closing times are different for the 50s vs. the 75s and 100s.) So the 50-milers would have all come and gone by the time we arrived, and there would have been no chance of seeing them on trail or at the hold. Unless Laura and Bill had caught up, Zephyr would have continued to be the only horse on the trail. We would have had to continue pacing off the runners. The closing time for Hold 4 was 9:00. At that point, management would begin to enforce the Closing times. We would have needed to cover that 18 mile leg in only 2 hours; we would have needed an average speed of 9 mph to make it. So, as much as it still pains me, it seems that I made the right decision. Will there be a next time? Maybe. I'd do a few things differently. First, I'd pick a flatter ride even if it is a few weeks earlier in the ride season. Heat and humidity are one thing, but add in mountains and it's just too much of a drain on both of us... at least for a first 100. Second, I'd find a mentor ahead of time who is an experienced 100-mile rider AND familiar with that particular trail AND willing to shepherd me through the whole thing. I'd completely forgotten what it's like to ride at the back of the pack and not be able to count on leapfrogging with other horses to keep Zephyr motivated. I've gotten used to running somewhere near the front and just occasionally hooking up with riding partners but not having one person by my side all day. I guess it would be OK to let ourselves be a little dependent when trying to get through a first 100. Third, I'd beg/borrow/steal an experienced crew member, hopefully who is experienced in crewing specifically for 100-mile rides. (There's apparently an art to pacing that is different than 50-milers, and I need all the help I can get.) Dad was great, he really got into his job, but he still had to ask me what Zephyr needed. I did NOT eat enough, though it wasn't Dad's fault. I just need someone who can just take my horse away to deal with him themselves, then push me into a chair in front of a wide selection of tasty tidbits to tempt my troubled tummy. Fourth and most definitely NOT least, if I decide to pursue this dream, I need to make a mental commitment to condition more. Not just go out and ride a nice moderate speed/difficulty loop, but actually make an effort to seek out hills and force Zephyr to perform a quality cardio workout despite his somewhat lazy-when-alone nature. So, given that the only two 100s within reasonable driving distance of home are Pine Tree and Vermont, it seems that IF I decide to do this again soon, Pine Tree will probably be my next attempt. 2009? We'll see how Changes 1-4 shape up. Next up? I wish I could make it to Western Maine for a 50 or two, but I promised hubby I'd be home for the next few weekends. So instead, next it's a 2-day 50 at The 'Burbs CTR on August 23-24. Then nothing in September (going to a wedding in NJ), and in early October the Maine 100 (a 3-day 100 CTR). After that, we'll be done competing till next May. If I want to do the 2009 Pine Tree 100 I should definitely aim for the May 2009 Bare Bones 50 as a warmup. Otherwise I can get by with the Brown Bag 25 CTR that same weekend. We'll just have to wait and see what winter training looks like. It started at the Shamrock ride a couple of weeks ago. Mom brought my sister Nellie & I to see who she wanted to take to the Big Horn. I didn't know then what I was getting myself into. Nellie always told me, "Mom is crazy", but I didn't believe her.... I know better now. Anyhow, At Shamrock I got to ride the first day. What a trail! The first loop had so many rocks, that Mom was worried about my barefeet. It didn't slow me down any, though. In fact, I really had a good time flying thru this loop. Too bad Mom had the bit in my mouth, I could've really gone fast with my sidepull. I guess she had the right idea though, because I started getting tired toward the end of the 2nd loop. I decided we should walk a bit here & there. We got to really enjoy the scenery this way. The 3rd loop there was really nice, too & short compared to the 1st 2. After tah 55 miles I was fairly tired, but it only took me 7 1/2 hours to do it. I got to rest & play all the next week until I had to go move cows for branding on Sat. That was a short ride, but fun. I got to chase down some of those sneaky cows & calves. Silly, trying to run away, not on my watch! The next day I got to go ride with a couple of my Michigan buddies in South Dakota. Ike & Huckleberry brought Monty out here. (He came home on Fri night.) I had had fun riding at Iron Creek, the trails there are pretty cool. Then I got to rest & play again until Thurs. That's when Mom put shoes on all of my hooves. I got tennis shoes on the front (Ground Control) & dress shoes on the back (lite rims). I behaved myself while she put them on, but I like going barefoot better. So, on Fri., I got to go to Shell, WY. I was suprised to see Ike & Huckleberry again. I guess Ike was going to ride in the 50 there. I was proud to tell him that I was going to go in the 100. (A little sacred, too-I've never gone that far-but, I didn't tell him that.) I didn't let Mom get much sleep that night. I kept talking to anyone who would listen. I was hoping for some extra goodies to eat or at least a little love. Finally, a little after 3 am, I managed to con her into some grain. It was a little bit of a backfire, when she saddled me up that early. She got a new saddle that is really comfy for me, even if it is heavy. It's 4 am, now & me & a bunch of other horses are trotting off into the prairie. There was still a full moon out so it was easy to see hwrere we were going. After awhile, we started going uphill for, like ever! The only good part about this trail was the grass--long & lush, just the way I like it. We eventually got to the top, only to go down & up & down & up & down & up............ The only good part about this trail was the grass, nice & green, just the way I like it. Finally! A vet check, rest, grain, yippeee. On the trail again. By now I have found a new friend. His name is Cabo. He is a Paso Fino. Buckskin even. He was fun to ride with. If i got tired or bummed out, he'd help me along & perk me up. If he got tired or bummed, I did the same for him. Nice guy, that Cabo. Before I knew it, we were at the next vet check. Did I mention that this trail is awesome? So many beautiful views! And the grass! So tasty! Just the way I like it. Down the trail we go again. Too bad, I liked the ski area. It was nice there. But there was so much more to see & I had Cabo for company. More pretty flowers (some were tasty, too, just the way I like them), cool creeks to drink from, sunshine & a perfect breeze. I did get a little lazy this loop. Maybe I should've tried to sleep better last night. Oh well. We did get to stop a couple of times & rest & eat, so it was ok.
Part of this loop went around a pretty lake. There were some loose horses there. A silly roan & a grey wanted to be endurance horses too so they followed us. They eventually had to go back at a gate. That's where I met a lady horse named Sabella. (She was a little cranky though.) There was another horse too, but I didn't get his name. We didn't have far to go to the next vet check. Wonderful grain, rest & grass, thick & succulent, just the way I like it. I left there alone, heading back to camp. Mom said we'd walk a bit for the others to catch up. Sabella came along 1st & then Cabo. I was glad to see them. We backtracked a ways on a trail we'd come in on earlier. After awhile, Mom found our turn off, even after the naughty cows knocked down the flag & blinky post. She got off & put them back up so others would find the turn in the dark. Shortly after, it did get dark. It was a beautiful night though. Perfect temp with a perfect breeze. The stinkin cows ate most of the grass, but there was still a little bit & some sage for extra flavor, just the way I like it. It took a little while before the moon came up. Boy was it bright once it did, though. It really helped us see the rocks when it came time to go down off the mountain. Mom said it took us an hour just to get down. That's when we saw our pit crew again. Man, they were having a good time! The important thing was the grain & the hay, soft & green, just the way I like it. I didn't really want to share it with Sabella & Cabo, but we were all so hungry. We just gave each other dirty looks while we stuffed our faces. Mom got a little crazy with the other girls--they were having LOTS of fun. After a bit, we headed on out across the prairie again. Almost back to camp. What a sweet place to be. I was having so much fun with the other horses! We all just flew on down the trail. When we were almost back to camp, Mom dropped my reins to grab the other girls' hands, that's when we really got cooking. I ran so fast, she had to let got of their hands to pull the reins. Hehehe. She got me slowed & we did it again. I was nicer this time. Finally, my saddle came off for the last time. I fussed a lot while Mom took it off & weighed on a scale. Then she took me to a nice spot to poop, pee & ROLL. Sandy & dusty, just the way I like it! We walked around a little bit 'cuz the vet was busy with some other horses. When he was ready, I dragged Mom over there so we could finish this thing up. Then I dragged her back to the trailer for some rest & hay, lots of it, stuffed tightly into a bag, just the way I like it. In deciding whether to do the 50 or 100 at Pine Tree this year, I took several things into consideration. Most importantly, I read all the Decade Team interviews at www.aerc.org. Regardless of how long it was before the rider took each horse to its first 100, most of them said they like to do a 50 about 3-4 weeks before the first 100 of the year. Since so far all we've done this year is a 2-day 60, I decided to opt for the 50 at Pine Tree and try for either the 75 or 100 at Vermont. The week before the ride, I spent a little time each night making sure I had everything in the trailer that I needed, and that it was arranged efficiently. I made a few improvements, like putting adhesive linoleum tiles on the wall under the bridle hooks in the rear tack, and like buying a tall narrow set of plastic drawers for "kitchen" stuff. I've never really needed that before, but one of my other improvements was a two-burner propane stove so I was going to need camping pots and utensils! I had everything loaded by Thursday at 11:00 p.m. As usual, there was no list, but I just knew I had all the essentials on board and everything else was fluff.